Back in about 2000, there was a major restoration started on the fresco in the dome of Karlskirche (St. Charles' Church) in Vienna. In order to do the work, they installed a platform at the level of the base of the dome with an elevator. At the end, they made the elevator open to the public (with purchase of a ticket, of course), which generated so much money for the church that the platform and elevator has remained. In just the last couple of years they greatly reduced the size of the platform. 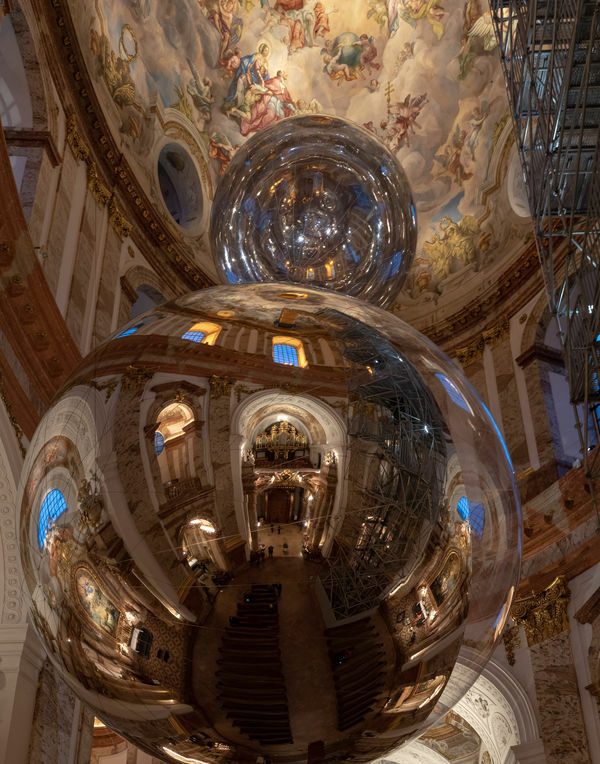 When we were there last week, there were two large reflective balls or balloons (not sure which) hanging in the church. The lower one was probably at least 15 feet in diameter. I kept trying to figure out how to capture a sense of the size of the space and finally decided to shoot 3 frames and stitch them in PS as a pano. I am in the photo, but hard to find.